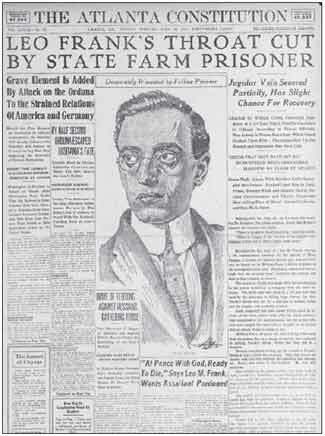 Leo Frank was attacked at the State Farm Prison in Milledgeville on July 17, 1915, by a fellow convict named William Creen, who slashed Leo's throat using a 7 inch butcher knife. Two inmate doctors got to Frank in the nick of time and stitched him up. Frank lingered between life and death for several weeks, but finally recovered. The wound was slow to heal in the boiling humid heat of the 1915 Georgian Summer. The wounds would split open again a month later, during the culmination of the Leo Frank case. The Detailed Version: The Shanking of Leo Frank in the Milledgeville Prison Dormitory on July 17, 1915. 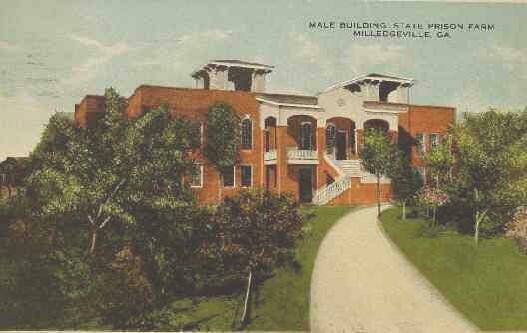 The photograph above is of the military barracks style dormitory where inmates slept in Milledgeville State Penitentiary. The famous prison housed some of the most high profile criminals in Georgia and served as a work farm located at the Eastern center of the state. 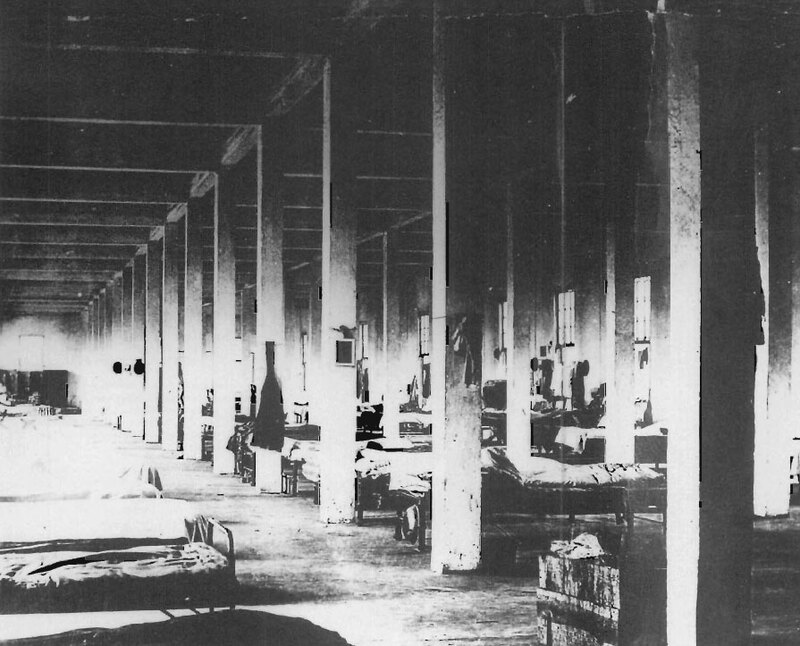 At the bottom left, third bed up, was Leo Frank's cot ('x' marks the spot). On the late evening of July 17, 1915, at 11:00pm, fellow inmate, William Creen (like Frank, also imprisoned for murder) -- who slept several cots north ('x x' marks the spot) -- slipped out of his cot in the late evening after the lights had been turned off at 8pm and every one was soundly sleeping. Creen tip toeing southward down the aisle toward Frank's cot in the inky gloom, concealed in his prison night gown an eight inch butcher knife. Creen's makeshift weapon of terror had been created from a large file of metal coarsely sharpened against stones in the kitchen, and was regularly used for slaughtering hogs, goats and chickens for feeding the prisoners and staff. Towering above his snoring victim, Creen in one single swift motion swiftly slid his webbed fingers deeply through Leo Frank's coarse greasy black hair, seizing it with an angry clenched fist, jerking Frank's head to expose his jugular, he sliced once across the left lateral side of his neck while uttering a curse. Creen backed away and dropped the bloodied shank to the ground while it clanked on the floor. Leo Frank flexed into the fetal position, fell to the floor screaming in terrified agony, moaning and groaning, sobbing intensely with his hands against his throat, jarred inmates began to awake annoyed in dark confusion. When the nightwatch security guard heard the commotion, he switched on the power breakers and spotted William Creen tip toeing back to his cot. A rapturous cacophony of perplexed voices ensued from the half-sleeping inmates pissed off from being awoken so suddenly under bright buzzing lights. As Inmates popped out of their cots, sitting up, squinting their red tired eyes, looking around to see what was going on, they witnessed the chaotic aftermath of this violent incident as people surged toward Leo Frank. Someone shouted Franks been cut, two fellow inmate doctors who had both been convicted of murdering their wives, who had already jumped out of their cots and rushed to the scene, pressed through the throng of inmates gawking and helping Frank. The inmate doctors used Frank's soaked bed sheets, compressing his wound and stitched him up with cotton thread like Frankenstein. They improvised using a clothing needle immediately bent into a curve around the post of his cot. Had these good Dr. Samaritans not improvised at a moments notice, Leo Frank would have likely died on the prison floor from the massive blood lose. Frank's bed and the floor adjacent to his bed sheets were drenched and spattered in blood like the Boston massacre. The prison staff rounded up William Creen and made the guilty slasher strip naked. The guards hand cuffed Creen behind his back and hog tied his legs, gave him an unmerciful righteous beating with billy clubs, pent-up frustrated fists and unforgiving boot kicks. The guards took the battered, moaning and bruised Creen to the prison's dungeon and threw him into one of the pitch black chambers to cool off. Creen would spend a few months in solitary confinement to think things over and would later be unrepentant. When Creen was finally released back into general population at the prison, his "street credit" had soared to that of hero status and people treated him with a new found sense of respect. He had almost killed the infamous Leo Frank. Leo Frank on the other hand was taken to the infirmary, was given emergency surgery by doctors who re-stitched up his poorly stitched up neck. Leo Frank's tender throat was slow to heal at the top of the humid summer and he lost a considerable amount of weight from losing his appetite. One month later the most audacious prison break in US history unfolded on the evening of August 16, 1915. See: American State Trials Volume X, 1918, by John Davison Lawson, LLD, for the details of the Leo Frank kidnapping and lynching. Last Updated: July 17th, 2013. Next post: August 18, *2013*, This Day in Jewish History, One Hundred Years Ago Today on August 18, *1913*: Climax of the Epic Southern Trial of 20th Century in Atlanta, Georgia, Leo Frank Mounted the Witness Stand and Made an Admission that was Delicious Irony!